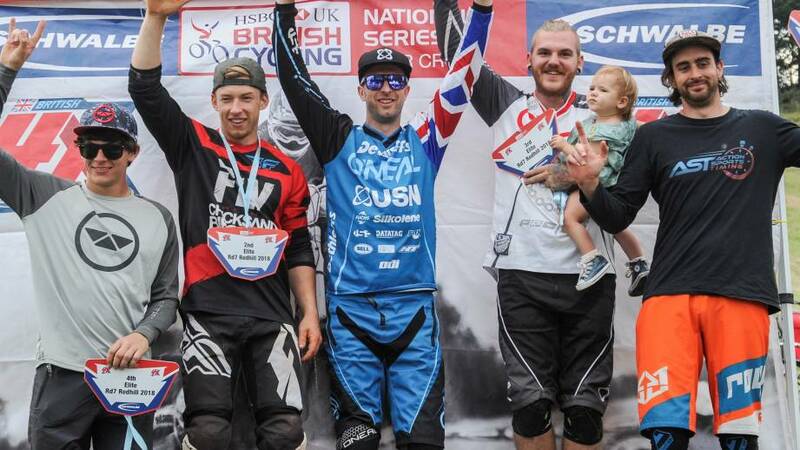 Newly-crowned national champion Scott ‘Boom Boom’ Beaumont took victory in the final round of the HSBC UK National 4X Series at Redhill, securing the overall series win in the process. The USN Racing rider came into the round knowing only victory in all races would be enough to overtake Kustom Bikes’ Declan Willicombe and he delivered when it mattered. Beaumont threw down the gauntlet early in the day in the motos, winning all three of his races to send a clear message to the other Pro Elite riders that he meant business. The 40-year-old led into the first berm in the final and never looked back, eventually extending his lead and comfortably crossing the line ahead of Connor Hudson in second and Alex Metcalfe in third. In the women’s elites, Dialled Bikes’ Megan Wherry clinched the final and series victory despite missing the round at Fort William. She went on to win all the remaining rounds, making it five victories from five to take the overall series from second-placed Courtney Abbiss. The final saw Wherry get off to a great start and although fiercely fought out with Abbiss, Wherry rode a smooth race and stayed in control throughout, holding out to cross the line ahead of Abbiss in second and Anna Feichtner in third.